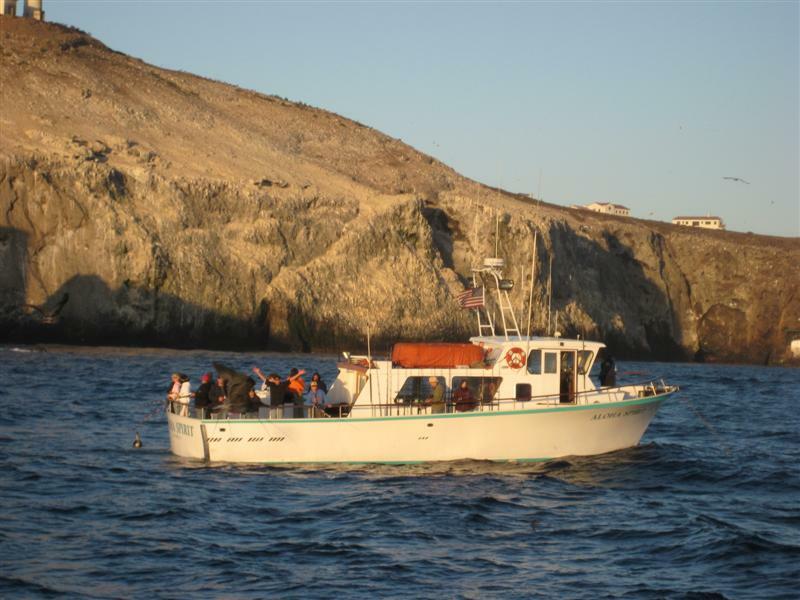 Earlier this year I saw a trip listed at HELGRENS SPORTFISHING aboard the OCEANSIDE 95 with a 10 percent discount if you booked early. My brother in law who lives in Ohio, had been wanting to do another tuna trip with me, so I called him and gave him the details. It didn't take much convincing, so I booked us on the trip and now had to wait for August to get there. As the time got closer, and the current tuna counts I was a little concerned about the trip, but then The reports of San Martin Island yellowtail bite looked promising. We arrived at the landing about 4 hours ealy and were the last to sign in, erveryone was anticipating what we would do for the trip and San Martin Island was everyones hopes. With everyone there we were allowed to board early and leave early. Capt Tim came down and introduced the crew and proceeded with the safety briefing, and then informed us that we would be heading for San Martin Island and it would be about an 18 hour run. Everyone went ot bed early and were up early to a hearty breakfast nad then started riggin to be ready once we arrived. We arrived at the island around 3pm, Capt Tim anchored us on a high point and a chum line was started,. Within minutes the shouts of fresh one and another biter we being shouted out and boils everywher around the boat. We ended up the evening with 40 yellowtail from 15 to 25lbs, what a great way to start the trip. The next two days were not as good as day one and we only to deck 22 more yellowtail. Many folks during the lull between bites would switch rigs and bottom fish for awhile, they managed many lingcod with the largest coming in at 20lbs and the biggest sheephead I've seen caught in many years. The sheephead weighed in at 22.5 lbs and lost to a yeallowtail by ounces for the 2nd day jackpot. Big fish honors went to Bob Bublitz with a nice 26lb yellowtail caught on day one. As for the crew, they worked the butts off trying to get us on fish and helping us when several fish we hooked up at the same time and preventing tangles. Capt Tim and his crew were outstanding and the meals were delicious and very large portions, no one went hungry. I would highly recommend the OCEANSIDE 95 for your next offshore trip. Look Closely - Belly hooked! !